If you've taken notice of the ramblings of myself and another kvlty black metaller around these here parts lately, you may have noticed us mention a shadowy unit by the name of Mystískaos here and there. But who are these people, exactly, and why should you sit up and pay attention? Let the questions be answered, and let the veil be peeled back. It is time to go deeper..
Just in case any memories have lapsed since our last mention of them, Mystískaos is several things: a musical collective, a budding record label, but most importantly a tightly knit group of extreme metal visionaries all united in their pursuit of more esoteric, trancelike takes on the black and death metal sounds. Founded around early 2016 or so by Alex Poole and HV Lyngdal, two big names for more psychedelic and atmospherically inclined black metal, originally Mystískaos was focused primarily on the various projects of its two founders, but in the past year especially it has evolved to the point of incorporating new members, generating new bands, and becoming a bit more multifaceted. Being that the collective is now in a period of expansion and change, the time is as ripe as any for an exposé on them and consideration of all their components. Here we have the predominant bands of Mystískaos and those most concretely regarded as "a part of." At present, the collective and the bands within it revolve primarily around the foursome of HV Lyngdal, Alex Poole, and Steven and Jack Blackburn. Any write up on Mystískaos would be incomplete without mention of the "elder statesman" of the collective: Wormlust. The masterwork of the mysterious, ever creative Icelander HV Lyngdal, while Wormlust has gained considerably more attention internationally after the wide acclaim that followed 2013's The Feral Wisdom, the roots of the band go back a good deal earlier, to 2003. Originally called Wolfheart and playing a more conventional, medieval brand of black metal, HV decided to shift things significantly into more psychedelic, mindbending territory after an inspiring encounter with that legendary Lurker Of Chalice album in the late 2000s, henceforth referring to the band as Wormlust. As Wormlust, the band employs an instantly recognizable brand of cosmic, supernaturally-inspired black metal oozing of eerie atmosphere and dark ambient influence. As we will explore a bit more later in this article, HV is quite the fan of ritualistic drone type music, and he incorporates a great deal of it into the larger body of his black metal sound, often resulting in a near 50/50 mix of the two, or at times even full on ambient releases under the Wormlust name, such as 2011's The Opium Sleep. Wormlust began performing live sparingly in 2016, and even did an incredible collaborative set with the Icelandic NYIÞ at Roadburn 2018, but HV hinted in our recent interview that after the Roadburn performance he's likely stepping away from the stage for a good while. Although HV has not yet released anything under the Wormlust name since the formation of Mystískaos, his crucial role in the maintenance of the collective should not be taken lightly. In addition to his elder statesman type role and serving as an enormous pool of inspiration for newer recruits, he is also a notable visual artist, and has designed album artwork and other insignia for not only some of the bands that he himself is involved in, but also Skáphe and Délirant as well. Much of the overall aesthetic and spiritual ethos of Mystískaos owes itself to HV, and the influence he extends over the collective is not to be underestimated. Give Wormlust a listen and go feral here. If Wormlust is the elder statesman of Mystískaos, the co statesman of the collective would have to be Alex Poole's Skáphe. Emerging in 2014, and apparently the result of a Chaos Moon track Poole was playing with that he found to be different enough in sound to expand into a new project, Skáphe was and likely still is the most mind numbing and otherworldly of Poole's various bands. With allusions to many other bands known for their off kilter takes on extreme metal, such as Wormlust, Arizmenda, and even Portal, with Skáphe Poole nonetheless developed an intimidating sound all his own: harrowing, psychedelic, and brain twisting black metal. Skáphe was originally started as a one manner with Poole responsible for everything, but soon came to include DG (of Misþyrming note) on vocals around late 2015/early 2016 as well. Although the band has thus been a duo ever since, it is still Poole who maintains responsibility for most if not all of the songwriting. Skáphe, like Wormlust, have played live as well but very minimally, appearing thus far only at a small handful of fests in the US. Elusive from the stage and ever evolving, Poole has implied his preference for each Skáphe set to be considerably different from the last. Enter the Skáphe portal over here. Martröð is still in a period of relative infancy, but is as close to a "Mystískaos supergroup" as anything. Just the lineup itself on this beast should get fans of more left field black metal foaming at the mouth, as it features HV, Alex Poole, and Wrest (Leviathan) on guitars, the prolific Thorns on drums, Misþyrming's D.G. on bass, and Aosoth's MkM in control of the vocals. Being that the styles explored by these individuals in each of their respective bands are quite similar on an aesthetic level, with Martröð it is somewhat difficult to say whose approach or vision exerted the most influence over the final product. There is unfortunately a small amount of material by which to judge Martröð at the moment, the project having only released 2016's 16 minute Transmutation Of Wounds EP thus far. Although it feels a bit incomplete, possibly due to its short length, the EP demonstrates that there's much potential to be explored in the future with Martröð. A mostly uptempo, frenetic black metal delivery dominates, reminiscent of some of the harsher moments from Wormlust and Leviathan, but more midpaced, melodic, and atmospheric deliveries rear their heads as well to make the whole listen more diverse and interesting. Given how involved each individual member of Martröð is with other music, releases may end up coming from the band at a comparatively slow pace, but Transmutation Of Wounds definitely packs a lot of good ideas, and recent posts on social media suggest that a proper full length debut from this group is on the near horizon. See what six crafters of black metal mayhem came up with here. Entheogen is the first Mystískaos band to have emerged after the foundation of the collective itself, debuting in mid 2017 when the unit had already been up and running beforehand. Although it features Alex Poole (on a rare occasion of doing vocals only), the real star of the show with this band is guitarist Steven Blackburn, who has associated with Poole for a while and also played guitar on the most recent Chaos Moon album. Even without Poole on guitar for Entheogen, however, if you were listening without knowing that it's not Poole on the strings, you would easily be forgiven for assuming that it is, as Blackburn's guitar style is very similar. A main difference however lies in the fact that Blackburn's playing is a little more straightforward and riff heavy, not as winding or atmospheric as the guitar styles found in Chaos Moon or Skáphe. This combined with an excellent rhythm section (including Steven's brother Jack on drums) results in an interesting sound for Entheogen: one that is a little rawer and more orthodox than some of the other, more psychedelic bands of Mystískaos, but that is still smothered in a distinctly contemporary aesthetic. Overall Entheogen is a fantastic example of how to craft black metal that feels somewhat old school but is still undeniably new school. Ingest that mind altering substance right here. The latest beast added to the core of Mystískaos, Guðveiki is easily its most suffocating and all out violent member yet. Featuring a sound that's more in line with death metal than the esoteric black metal common of many of the other Mystískaos offenders, Guðveiki is a vile creature and, like Martröð, is also something of a supergroup, this time featuring HV on vocals, Alex Poole and Steven Blackburn on guitars, and Jack Blackburn (also the drummer for Entheogen) on the kit. On the group's Vængför debut, released only a month ago, a truly cacophonous, asphyxiating sound dominates, bearing some similarity to Skáphe, but also far less atmospheric and more nightmarish. Recreating sounds that demons probably make when clawing their way up to our plane from the depths of the netherworld, the most noticeable aspect of Guðveiki's formula would probably have to be the relentless drumming of Blackburn, who brings an almost George Kollias-like approach here that could easily melt your skin off if you're not careful. In some respects this drum-heavy sound and the overall mixing on the album leaves the guitars feeling a bit smothered distant, but considering the fact that the production on Vængför sounds considerably different than anything else released by the Mystískaos guys up to this point, this approach to the sound on the album may have been at least partly intentional. Ferocious and pummeling, the literal translation of the band name ("God disease" in Icelandic) fits Guðveiki well. Time will tell whether this group will generate more material, or if Vængför ends up being more of a one off, collectivized endeavor. Succumb to the disease right here. The status of these bands with regards to their inclusion in Mystískaos is a little shakier. Though not "actual" members of the core collective outlined above, they are more or less considered as associates, detached from the main body, perhaps, but still nonetheless connected to the group either through shared members, a strong aesthetic bond, etc. Occasionally, as in the case of Chaos Moon or Délirant, albums will be released on cassette by Mystískaos while LP or other versions are handled by another party. After Wormlust, Chaos Moon is the oldest of the bands covered here, stretching back to 2004. Originally the one man project of Alex Poole, with the most recent Eschaton Mémoire album it has seen a lineup expansion, now featuring Eric Baker on vocals and Steven Blackburn, a longtime friend of Poole's, on additional guitar and effects duty. Chaos Moon could be thought of as perhaps the most melodically inclined band when the entirety of Mystískaos (core and outliers) is taken into consideration. This is certainly not to say that other bands here are lacking in the melody or atmosphere departments, but with Chaos Moon this angle of the music often appears to be less ominous and psychedelic than, say, Wormlust or Skáphe and more in line with older brands of atmospheric and ambient black metal. Interviewing Poole in 2017, he mentioned that much of Chaos Moon's influence derives from his experiences listening to Emperor while younger, and while certainly not a clone of the band, it's easy to see how Chaos Moon similarly transitions between moments of harsh abrasiveness and those of more sublime, epic majesty with its songwriting. Let the moon hypnotize you over here. 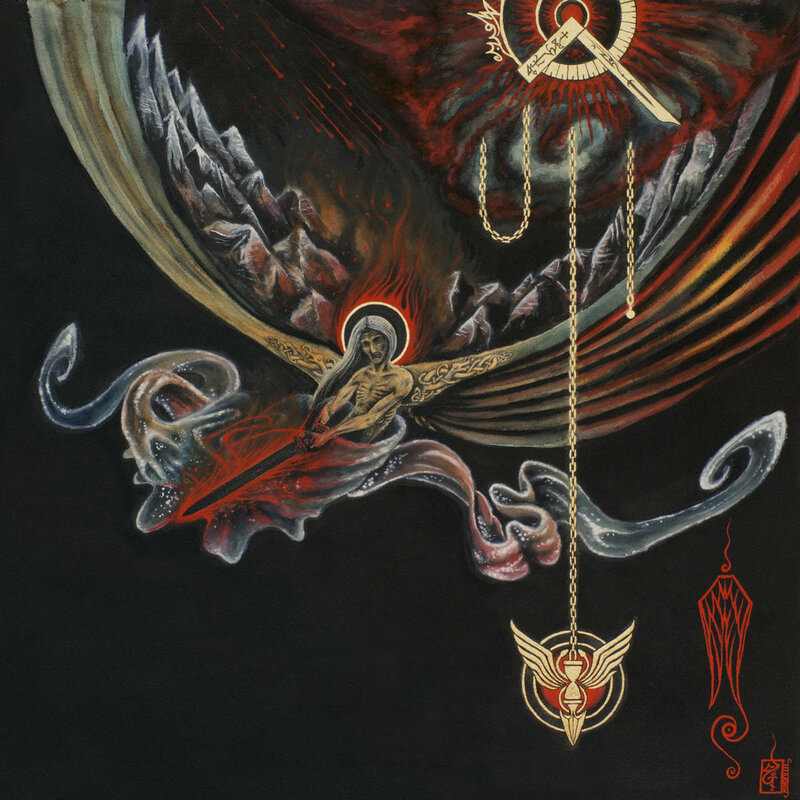 Afpsrengi Satans was once a part of the main unit of Mystískaos, but for one reason or another appears to have run its course at present, with its sigil mysteriously vanishing from the collective's Bandcamp page and much of its online material that was available for listening likewise disappearing. A one man project from HV Lyngdal, Afsprengi Satans had the distinction of being the only nonmetal member of Mystískaos, employing a ritualized dark ambient approach as opposed to the more dreamlike, psychedelically-tinged black metal the collective is more known for. It could be thought of as something like "Wormlust minus the black metal," but was also considerably more than that. Some releases from HV under this moniker, such as 2016's Seiðgall, were more formless and atmospheric, while others such as 2017's impressive Djöful Leg went in a more structured direction with the addition of percussion and eerie spoken word type chants. A powerful lesson in ambient shamanism as well as HV's ability to shed his metal identity for something significantly different, Afsprengi Satans will certainly be missed by this writer. Another HV only project, Ljáin can be thought of something of a more aggressive take on the Wormlust sound: still swirly and psychedelic, but more abrasive, heavier on the treble in the mixing, and all around meaner and uglier. According to an interview he gave around the time Wormlust started touring, HV got the inspiration for Ljáin after having a series of dreams in which he was playing in a band of "silhouetted figures." The experience clearly left an impression, and blossomed into its own animal from there. To date there are only two EPs from Ljáin, both released almost back to back in 2016: Endasálmar and Klofnar Tungur. It would appear that these releases are somewhat regarded as two halves of a whole, as they were subsequently collected onto a compilatory release in 2018 including all the tracks from each EP. Stylistically speaking there's not too much of a difference between them, although Klofnar Tungur does appear to be a bit more midpaced and on the atmospheric side. It's unclear what else is to come from Ljáin at the moment, but this article and the statement from Alex Poole in it regarding upcoming Mystískaos releases mentioned a joint release between Ljáin and Entheogen in the future. With luck, it will be approaching soon. Ljáin apparently means "scythes" in Icelandic, so be careful with this one. Lastly we come to Délirant, whose current status as an outlier or core member of Mystískaos is something of a mystery. Délirant is the one man project of a Spanish individual going only by D.B., who is also behind Negativa as well. Considering the fact that HV Lyngdal did vocals on the most recent Negativa album, it is clear that a sense of artistic kinship and camaraderie runs between D.B. and Mystískaos. Released virtually simultaneously with the Guðveiki debut, Délirant's self titled debut album is a surreal, intoxicating journey through realms of ever shifting black metal psychedelia. There are sprinkles of Wormlust and Leviathan in the sound, but not to the point of Délirant becoming an all out imitator of either, and in particular the more ambient-esque moments that come out of D.B. have a distinct ringy, static-y hum to them that's especially satisfying. With some pretty high level songwriting and great artwork to boot (also by HV), the debut of this otherworldly project has definitely made it one to watch, and hopefully Délirant's association with Mystískaos will only continue to yield more quality material in the future. Go here to enter the realm of delirium. Mystískaos began as a sub label of the esteemed Fallen Empire Records, and still technically is. But with Fallen Empire seeing its end last year, the time is ripe for the budding collective to expand and begin handling more of its own distribution and media. Indeed, Mystískaos has handled the impending FE demise quite well last year, continuing to release material and forging new partnerships not only with musicians but visual artists as well, such as with Panegyrist's Elijah Tamu, who designed the album artwork for the Guðveiki debut. Although releases from Mystískaos at times feel as though they come at a slow pace, more often than not they end up being well worth the wait. Furthermore, 2019 in particular has been hinted to be a year in which several simmering efforts from the collective will rear their heads for open release to the public, including a Wormlust/ Skáphe collaborative album as well as Wormlust's long awaited follow up to The Feral Wisdom. All in all, psychedelic black metal as a sub sub genre has expanded quite significantly in the 2010s, with many different interpretations: some more lighthearted, bouncy, and embracing of traditional psychedelic rock influences, and others more embracing of the dense, ominous, vortex-like take on psychedelia. Without a doubt, Mystískaos are certainly one of the outfits to thank for the slow but steady rise of the latter. If you're a fan of the music of any of its members, or just can't get enough of more nontraditional, atmospheric takes on extreme metal, you should definitely keep an eye on this bunch as they move forward to new horizons that almost certainly promise dazzling results. *A big thanks is also owed to Alex Poole for help with some info that aided in the completion of this article. Cheers, and keep the lawless devouring psychedelia a'coming. Kinda curious to see how much they actually will branch out outside of the main two members. Delirant was a pretty intriguing beginning in that direction. Still kinda bummer about AS no longer being part of it or even available online. Also curious how ex-Fallen Empire bands like Mahr and Voidsphere will fare post the close. Those two as well as Arkhtinn and Hwwauoch all share members from what I understand. The "Prava Kollektiv," according to MA. Not Mystiskaos, but definitely brethren (one would think anyway), so hopefully they can all help each other out. I love Skaphe and while I'm still digesting Delirant, their sound is right up my alley. I'm looking forward to exploring the other bands listed here. It never fails to blow my mind how much great music is out there, so thanks for putting this together. It's articles like this that keep me coming back.